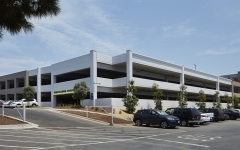 The new LEGOLAND Employee Parking Structure is located at the LEGOLAND California Resort in Carlsbad, California. LEGOLAND California is a theme park which includes a LEGO-themed aquarium, water park and hotel. 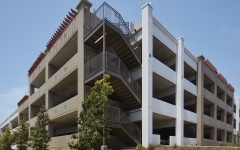 In conjunction with the adjacent surface parking lot, the three-level, 618-stall structure serves employees of the resort. Sited near the main employee entrance at the rear of the resort, the structure is set into the slope to minimize visual impact. Storm water captured within the garage is discharged to a planted bio-filtration area at the lower end of the site, naturally removing contaminants. 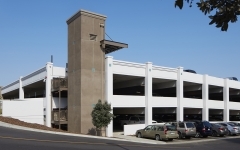 The simple painted concrete façade includes plaster accents and recessed decorative tile, as well as metal trellis elements at key locations along the parapet.